Hi, all! I’m Mari, a writer for Arcadian Lighting, a terrific online place to find beautiful lighting fixtures of all sorts. I’m so excited to be here visiting Lintels and Lallies today, with a guest post about one of my decorating obsessions—colorful velvet. For me, there is nothing more inspiring than velvet—unless perhaps it’s velvet on a chair (my first love is chairs) like the irresistible ones in the dining room below. It seems to me velvets are showing up more and more in today’s interiors no matter their style. 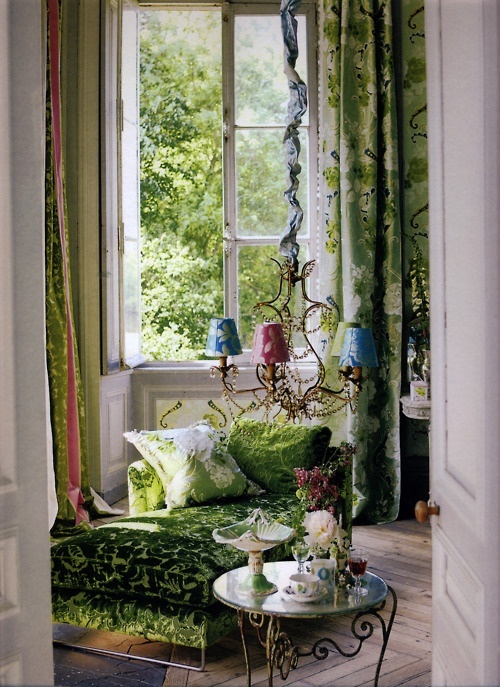 This sumptuous fabric looks as gorgeous in contemporary spaces as it does in ornate classic rooms. Here are some of my favorites. Please enjoy! Here, velvet floor cushions in a deep golden hue are a beautiful contrast to the long silvery tufted sofa. Lush velvets are a lovely choice for this elegant living space. 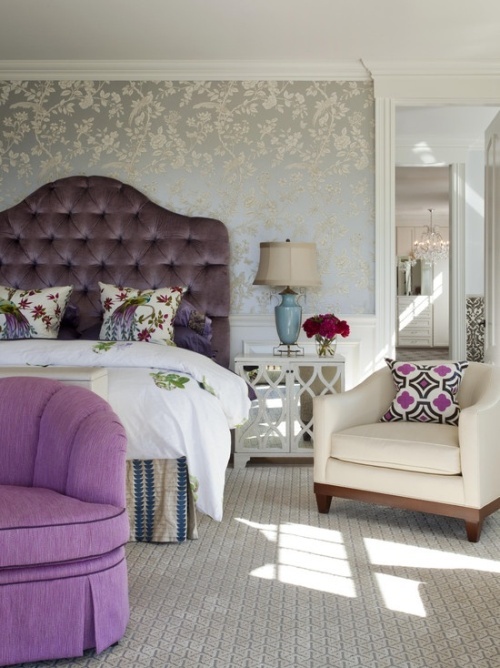 This tall tufted headboard is lovely in purple velvet. Colorful peacocks looks gorgeous against the headboard. Rosy velvet looks stunning on an antique chaise in this traditional room. I love the wood trim on the lounge and the brass lamp and wall sconce. Deep teal velvet creates multiple points of interest in a modern living room. 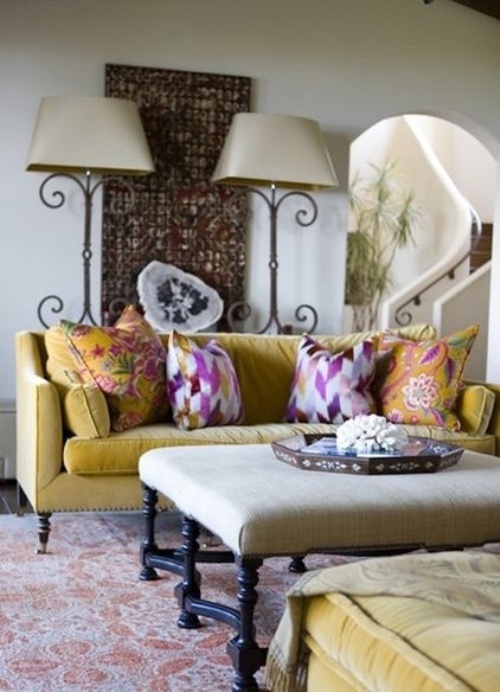 How lovely are those massive brilliant yellow table lamps? It is no surprise that jewel tone velvets look gorgeous in glam interiors. Delicate French garden-inspired chairs upholstered in deep turquoise velvet surround a Hollywood Regency style table in this beautiful dining room. Here, a gold vintage velvet sofa (and perhaps a chaise seen in the lower right corner) combines beauty and a look of comfort. The tall metal lamps offer a big style statement behind the sofa. Is shabby chic or vintage your style? This colorful space shows just how gorgeous velvet looks in a shabby space. Isn’t that green embossed velvet stunning? What do you think of Velvet inspired décor? Let us know in the comments! And be sure to stop by Arcadian Lighting for a brilliant wall sconce or pendant light to brighten your home!